It’s been a long time since we started this project, since last Memorial Day weekend in fact, but now it is DONE! yes, your heard right, the pickets have been carefully removed and picked over (smack-tested in fact), sanded, new ones made out of cypress (“replace in kind,” getting the original bois d’arc is another matter), the post holes dug, the frame built, gates built (btw – new gate on the south side of the front yard!) pickets painted, the frame painted (thanks to some local painters on that last one) and finally, FINALLY, putting the pickets up and completing the fence. The final day was a mess of people, as has been the norm, additional Mitchells (J’s family from Louisville) showed up and true to fashion pitched in, Mom had barbecue from the Shell for us, homemade cole slaw, and clementines. 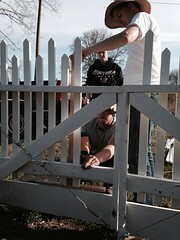 We worked down the fence in 2 teams of 3 with a nail gun apiece, one to hand off the correct picket (long-shorts or short-shorts, long-longs or or short-longs, or maybe even really short shorts, these things were important! 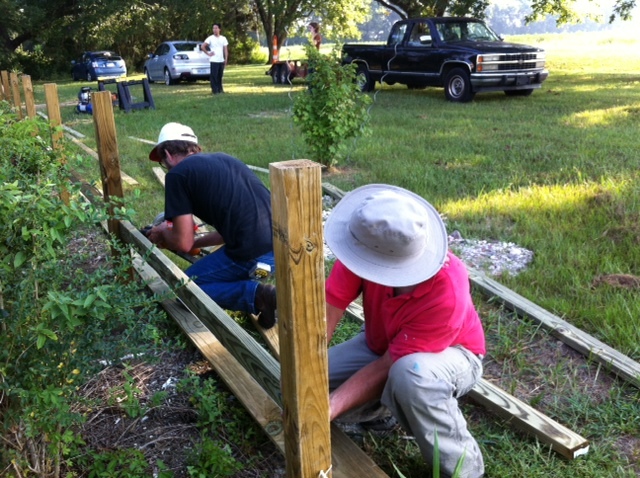 ), someone to hold it against the fence and someone with a strong arm to operate the nail gun. One team was faster, I won’t say which, and our fearless leader J went about finished the gates which are several and very spiffy, that is to say, wonderfully operable. 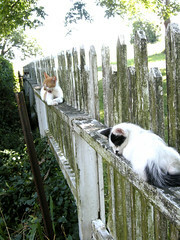 Yes, we are pleased with our fence. Next step (oh yes, there is always a next step, no time for sitting on the porch yet guys — oh wait, what porch? or is that another story?). 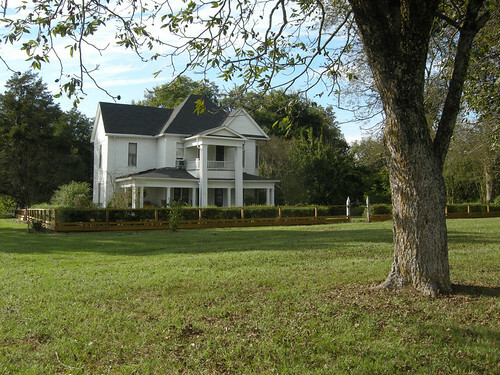 Next step: build the wire fence around the orchard side and blockade the rear so that our Bella cannot run [too] free!! frame up, pickets and frame awaiting a coat of paint! ok, I should’ve posted this in, what, October? What is a fence? it is utilitarian, keep kids in and animals out, a rabbit board for instance, like our picket fence has touches the ground all around so that rabbits cannot get into the yard. Whether this was ever successful I don’t know, but most of our rabbits live in the hedge now, just inside the fence, and give us no trouble. Most importantly for a decorative picket fence like Sunshine’s, is that it ties together the domestic scene. 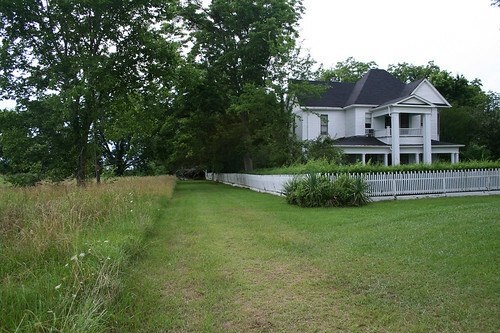 As Dad wrote in one of the booklets, “it competes with the house for the viewers attention” and “delineates the main entrance (with two gate posts), the front yard, the flower gardens on either side of the house and backyard…” It was the longest picket fence in Noxubee County, measuring (as we recently did) 100 ft across the front, 180 ft down the South side (by the driveway), and another 120 ft of pickets on the orchard side. The backyard is, and probably always has been an easier to maintain wire fence. 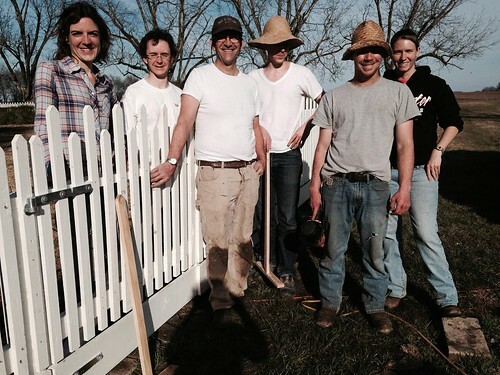 How do you rebuild a fence? On the verge of starting the fence project Uncle J fessed up that he’d been part of the team (in ’69 or ’70, anyway, he was still in high school and able to the be recruited for little or no compensation). Turns out we are doing it 2013 the very same way they did it back then, which make us feel a little relieved, like surely we’ll be spared the wrath of the grandmother for doing something as drastic as taking the fence down to the ground! After dismantling, we are rebuilding the frame from new wood but we have salvaged all the pickets we can, have sanded them and will prime and paint them and put the back up. Old pickets are historic pickets which we like so those will go across the front first, then newer pickets down the driveway side. Back in ’69/’70 they made the opposite decision and put the old pickets along the most hidden side, by the orchard, and that is where we found most of the most historic pickets. 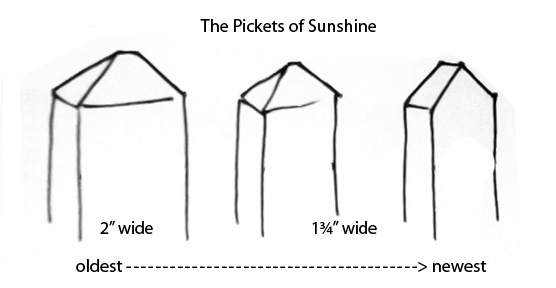 Hand-cut pyramids grace the tops of pickets that were the original true 2″ width instead of the now standard 1 1/2″ (or 1 3/4″?). In between (years or just flukes of the earlier craftsmen?) some narrower 1 1/2″ pickets also have pyramids and few c. 1969 have perfectly cut pyramid tops that we all suspect are Dad’s work. And guess what? those oldest pickets, worn as they maybe on the exterior, are much harder wood—bois d’arc (bodark) or cedar—and passed our “smack test” far more often than the c. 1969 pickets which were not even on the damp, vine-covered, orchard side of the yard. We shouldn’t be surprised by the superiority of 100-year-old building materials compared with those of the last 50 years, but we always are. I’ll spare the details, but suffice it to say after numerous calls: 1) unlikely I can get stainless steel nails in hand by Friday, and 2) I have been advised by two knowledgeable, disinterested gentlemen, the second one is with Follen, that hot dipped galvanized, covered with paint, is as good. The first guy, with Fastenal, used to work at Southern Fasteners, which could get us stainless by next Tuesday. He said that in his years at Southern the only time they sold stainless was either on high end government jobs, like the Governor’s Mansion, where cost and good sense were out the window, or unfinished/unpainted decks where the owner wanted to look down and see shiny nail heads. 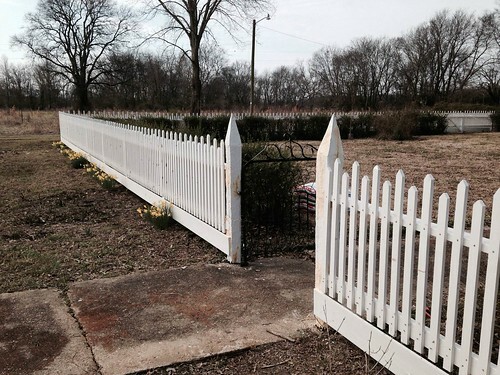 Both guys said, on a picket fence to be painted white, stainless was unnecessary, costly overkill. Now it’s back to HD or Lowes looking for hot dipped 21 degree hot dipped galvanize to fit Paul’s nail gun. Gotta go, clients calling, all from big cities and they don’t understand any of this.